Hardin Lang is vice president for programs and policy at Refugees International. 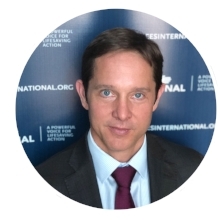 A veteran of six United Nations peacekeeping and humanitarian field missions, Hardin has worked in Afghanistan, the Balkans, Myanmar, Central America, Gaza and West Bank, Iraq, Haiti, Jordan, Lebanon, Tunisia, Turkey, and West Africa. During his UN tenure, Hardin helped launch the UN stabilization in Mali, served as head of office for the UN special envoy for the Haiti, and worked on the UN mission in Afghanistan. In Iraq, he served as chief of staff for the International Organization for Migration’s humanitarian and stabilization mission and later as an adviser to the UN special representative in Baghdad. Earlier in his career, Hardin spent two years working for the UN mission in Kosovo and three years working for the UN and human rights organizations in Guatemala. Immediately prior to joining Refugees International, Hardin was a senior fellow at the Center for American Progress (CAP) where he specialized in Middle East conflicts and national security policy. He has also been a senior fellow at the Center for Strategic and International Studies (CSIS). Hardin has published widely, including in the Wall Street Journal, Foreign Policy, Newsweek, and U.S. News and World Report. Hardin holds a master’s degree in public policy from Princeton University’s Woodrow Wilson School of Public and International Affairs, a master’s degree in international history with a focus on the Middle East from the London School of Economics, and a bachelor’s degree from Oberlin College. The humanitarian situation in Syria is fragile—and a lot is at stake with a planned U.S. reduction in troops. Jesse Marks and Hardin Lang outline what must be done to respond to the current humanitarian crisis and to protect civilians. The sudden withdrawal of U.S. forces from Syria that Trump has called for, potentially within as little as 30 days, would pose severe humanitarian risks. Read more by RI’s Vice President Hardin Lang. Yemen’s internationally recognized government and the Houthi-led rebel movement agreed to a cease-fire in the port city of Hodeidah and its surrounding governorate on Thursday, following a week of UN–sponsored peace talks in Sweden. If it holds, this agreement would mark a major diplomatic breakthrough. Here’s why it matters and what to watch moving forward. While it is too early for optimism in Yemen, external pressure may be creating an opportunity to end the war. If the United States decides Syria is not worth its attention, civilians will once again pay a high price.